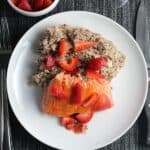 This Quinoa with Salmon and Strawberries post is sponsored by Florida Strawberry Growers Association in conjunction with a social media campaign through Sunday Supper LLC. All opinions are my own. I’ve long been a fan of fresh Florida Strawberries. 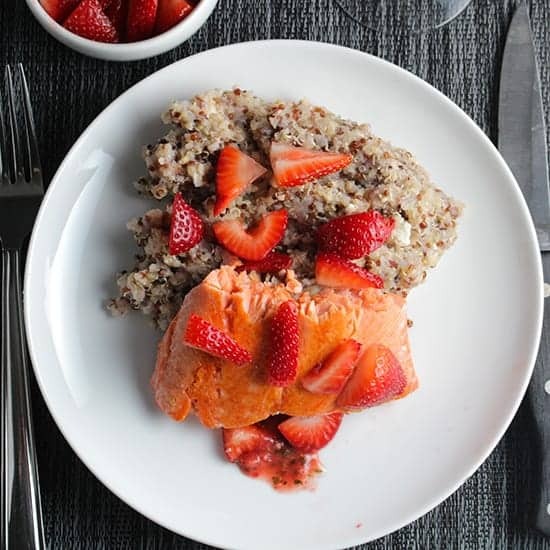 But working on this Quinoa with Salmon and Strawberries recipe opened my eyes to what a great, healthy addition to a meal Florida Strawberries can be. I eat strawberries quite a bit, most often simply sliced on my cereal. When they are at peak freshness in season, I will nibble some plain as a snack. 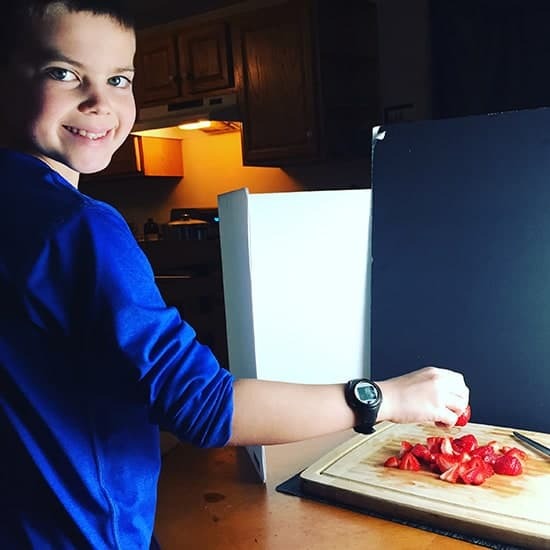 My 10 year old sous chef loves to join me in a strawberry snack! And he’s eager to make another batch of Dairy Free Strawberry Smoothies with some Florida Strawberries now that they are in season. If you are a New Englander like me, you might scratch your head at the notion of strawberries being in season as January approaches. I think of fresh, local strawberries rolling into markets here in June. But it’s true, Florida Strawberries are now in season, bringing a taste of a summer day to a cold New England winter! Now that I understand why one of the best desserts I have had was during a January trip to Florida. It was a simple preparation of simple fresh Florida Strawberries with melted chocolate. No wonder why it was so good, I was catching the peak of Florida Strawberry season without even knowing it! But we’re not here today to talk about slicing strawberries on your cereal, or how to feature the berries in a tasty dessert. You already know about that! Today we are talking about how Florida Strawberries can play the starring role in a tasty and healthy meal. Speaking of healthy, check out the Strawberry Sue website for more information on the health benefits of Florida Strawberries. Featuring strawberries in a dinner recipe was new to me going into this recipe. I’ve enjoyed fruit with fish recipes many times, so thought I’d try to do something with salmon and strawberries for this meal, served with quinoa for a super nutritious meal to jumpstart your healthy new year plans. I used most of a 1 pound package of Florida Strawberries for this recipe, saving a few for snacking. I should say we, B was a big help in making this recipe! 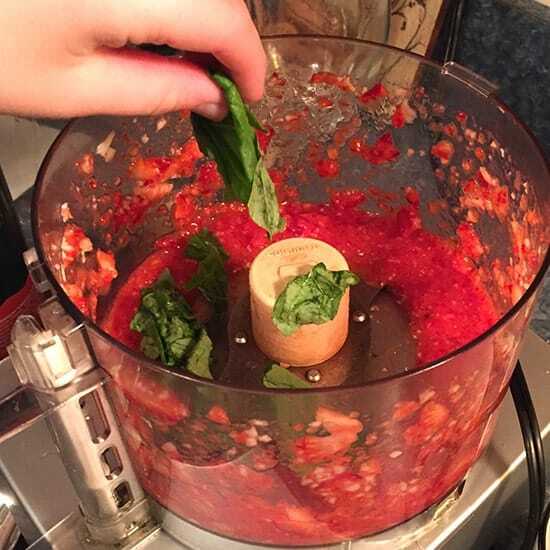 We divided the strawberries in half, pureeing half in the blender with some garlic, honey and basil. The rest of the Florida Strawberries were sliced for the topping. One note: the pureed strawberry mixture is very tasty for our adult palates, but if your young sous chefs haven’t acquired a taste for raw garlic yet, you might want to pull out some strawberry puree for them without the garlic. 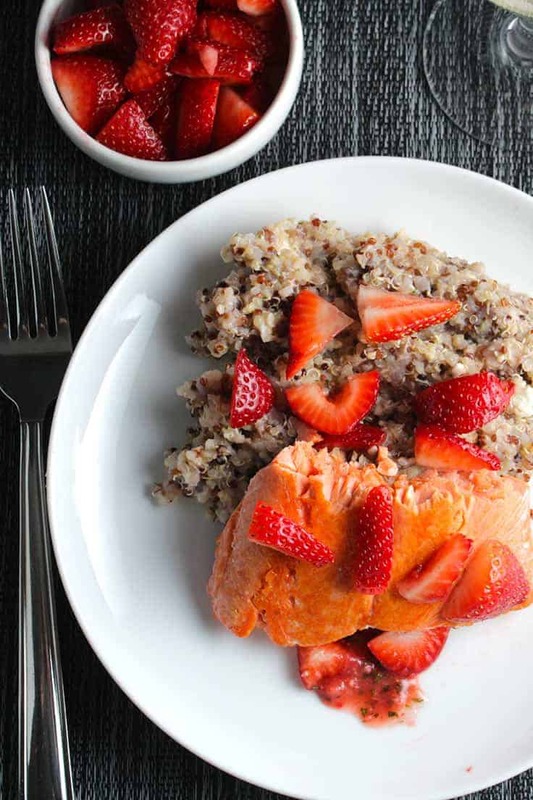 This Quinoa with Salmon and Strawberries preparation is pretty simple. Letting great ingredients shine is always a good cooking approach! The cooked quinoa gets tossed with the strawberry puree and some feta cheese. Then quick pan seared salmon gets plated with the quinoa, topped with sliced fresh Florida Strawberries. The strawberry puree seeps into the quinoa, so it doesn’t show in the picture, but what great flavor it adds! Salmon cooked just right, along with the super fresh Florida Strawberries on top, and you’ve got a delicious meal! This meal is good enough on its own, but if you want a real treat, add one more thing–Champagne! 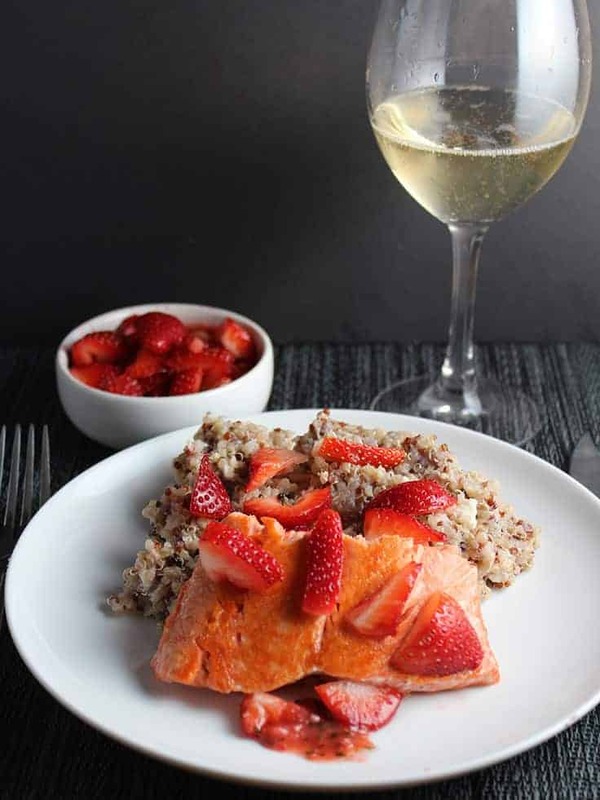 Earlier in the evening I’d sampled a very good and reasonably priced Champagne, and correctly anticipated it would be perfect with our Quinoa with Salmon and Strawberries. A big tasty of summer even in the winter! Quickly pan seared salmon served on a bed of quinoa flavored with fresh Florida strawberries, topped with strawberry slices. Start cooking the quinoa. Heat the water to boiling, stir in the quinoa. Reduce heat to medium low, and simmer covered for 16 to 20 minutes until the water is absorbed. Cut 12 of the strawberries into slices about 1/4 inch thick. Set aside to finish the dish. Meanwhile, make the strawberry puree. Place 12 of the strawberries and the garlic in a food processor, whir to puree the strawberries. Add the basil, olive oil, honey, pinch of salt and mint or lavender. Puree again to liquify and combine all the puree ingredients. Set aside. When the water in the quinoa has been absorbed after the 16 to 20 minute simmer time, remove covered and stir the quinoa with a fork. Stir the strawberry puree in with the quinoa. Add the feta, stir to combine. Cover the quinoa to keep warm while you pan sear the salmon. Spray a skillet with cooking oil and add the tablespoon of canola oil. Heat the pan on medium high. Rinse and pat the salmon dry. When the pan is good and hot, place the fish skin side down, and cook for 4 minutes without moving the fish. Turn the fish back to the skin side one more time and let it cook in for 1 to 2 more minutes. At this point, gently cut open the fish at a thick spot to check for doneness. The actual time will depend on the thickness of your fillet, but it likely be done after the 8 minutes total cook time. Remove the salmon to a platter, and cut into serving portions. Plate a portion of the quinoa and strawberry puree. Place a portion of salmon on the quinoa, then finish by sprinkling the salmon slices over the salmon and quinoa. Enjoy this healthy and tasty meal featuring Florida strawberries! Check out all the great #SundaySupper recipes featuring fresh Florida Strawberries! 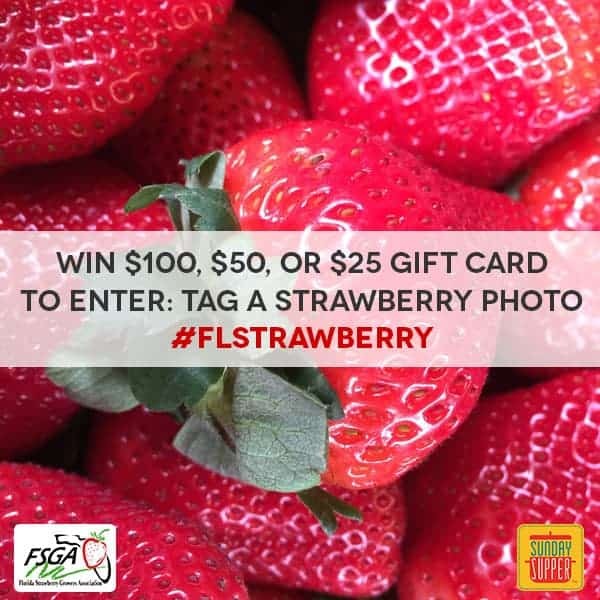 To Enter: Share a photo featuring a strawberry using the hashtag #FLStrawberry and you could win a $100, $50, or $25 gift card. Contest runs from 12/27/15 – 01/17/16.Winners will be chosen at random and announced during the LIVE #SundaySupper Twitter Party 01/17/16. Must be US resident 18 years of age or older. 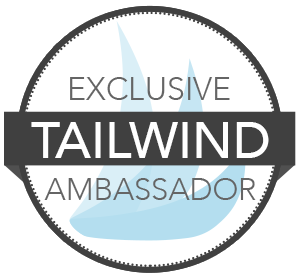 This promotion is not sponsored, endorsed, administered by, or associated with Instagram. What a combo! I love the puree mixed IN the quinoa – I can’t wait to try this! Thanks Nichole, I really like the way puree came out and flavored the dish. Love that you mixed strawberries into the quinoa. I bet that gives it a lovely flavor. What a great idea for salmon! Such color! I just love the thought of that nutty quinoa texture and the bright acidity of the strawberries. Thanks Katie, it was a nice combo! I think this may be the recipe to get my husband to eat quinoa (because he loves strawberries so much). I had to give quinoa a few tries before I liked it! What a wonderful combo! I love how you included the strawberries with the salmon. So creative and what a beautiful dish!! Thanks Marion! I appreciate all your effort pulling this tasty event together! Salmon has been my favorite fish since we lived in Alaska. What a great way to serve it! ooh, would love to have some fresh right there in Alaska! That’s where ours is usually from. I love a simple, easy to prepare dish like this. Bonus points that it looks gorgeous too! Amazing!! Honestly one of my favorite Sunday supper recipes ever! I could eat this everyday!! Thanks Krayl, we sure liked it!